Lens Description: Uniform sharpness and minimal distortion across the entire image area, even at full aperture, distinguish this lens. This was achieved with, among other factors, a lens element with an aspherical surface. The lens makes highly dramatic effects possible, like monumental foregrounds, strongly receding backgrounds and a wide horizon. 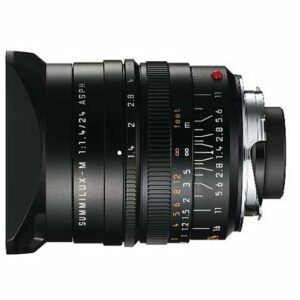 With this lens, focusing and exposure metering are performed by looking through the camera\'s viewfinder, whereas the actual field coverage is checked by means of an accessory brilliant viewfinder.